This album of short Bach voluntaries ideal to play before or after the service, or during a break, such as the signing of the register in a wedding. 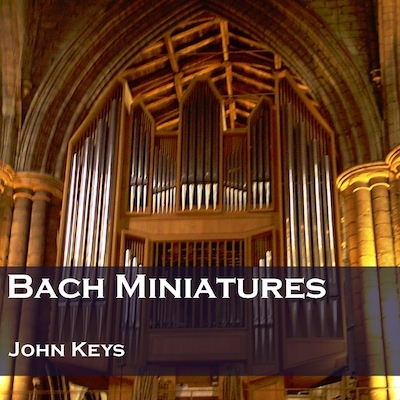 With a mix of well-known favourites, such as Jesu, Joy of Man's Desiring and the less well known but exquisite "eight short preludes and fugues", the album is packed with excellent Bach pieces to accompany any service. Although there are 15 pieces listed, there are 26 tracks, as preludes and fugues are recorded separately and the Pastorale stretches over 4 tracks, keeping the "miniature" style. The CD can be bought online here. Alternatively, you can drop us an email at info@cul.co.uk with your order requirements and we will send back an invoice with the bank details to make a bank transfer, orn send a cheque for the appropriate amount made out to Creativity Unleashed Limited to Creativity Unleashed Limited, 31 Eastbury Way, Swindon SN25 2EL, or buy using a card over the phone on 0117-230-7123 (Cheques and purchases over the phone in pounds sterling drawn on UK bank accounts only). Any or all of the tracks for this album can also be download from Amazon and iTunes, or the whole Voluntaries set directly from us. To download the whole set from us, use the Buy Now button here. For individual tracks or the whole album from Amazon/iTunes use the appropriate button in the Tracks Included section below.